Advances in emerging surveillance technologies like cell-site simulators – devices which transform a cell phone into a real-time tracking device – require careful evaluation to ensure their use is consistent with the protections afforded under the First and Fourth Amendments to the U.S. Constitution. The United States’ military and intelligence agencies have developed robust and sophisticated surveillance technologies for deployment in defense against threats from foreign actors. These technologies are essential to keeping America safe. Increasingly though, domestic law enforcement at the federal, state, and local levels are using surveillance technologies in their every-day crime-fighting activities. In the case of cell-site simulators, this technology is being used to investigate a wide range of criminal activity, from human trafficking to narcotics trafficking, as well as kidnapping, and to assist in the apprehension of dangerous and violent fugitives. Cell-site simulator technology provides valuable assistance in support of important public safety objectives. Whether deployed as part of a fugitive apprehension effort, a complex narcotics investigation, or to locate or rescue a kidnapped child, cell-site simulators fulfill critical operational needs. As with any law enforcement capability, the Department must use cell-site simulators in a manner that is consistent with the requirements and protections of the Constitution, including the Fourth Amendment, and applicable statutory authorities, including the Pen Register Statute. Moreover, any information resulting from the use of cell-site simulators must be handled in a way that is consistent with the array of applicable statutes, regulations, and policies that guide law enforcement in how it may and may not collect, retain, and disclose data. 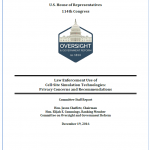 This Executive Summary provides a brief overview of the results of the Department of Justice (Department or DOJ) Office of the Inspector General’s (OIG) third review of the Federal Bureau of Investigation’s (FBI) use of the investigative authority granted by Section 215 of the Patriot Act. Section 215 is often referred to as the “business record” provision. 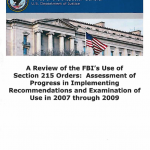 The OIG’s first report, A Review of the Federal Bureau of Investigation’s Use of Section 215 Orders for Business Records, was issued in March 2007 and covered calendar years 2002 through 2005. The OIG’s second report, A Review of the FBI’s Use of Section 215 Orders for Business Records in 2006, was issued in March 2008 and covered calendar year 2006. This third review was initiated to examine the progress the Department and the FBI have made in addressing the OIG recommendations which were included in our second report. We also reviewed the FBI’s use of Section 215 authority in calendar years 2007, 2008, and 2009. 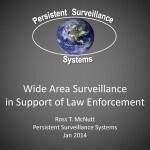 A presentation from January 2014 produced by an Ohio-based company called Persistent Surveillance Systems that produces systems for wide area surveillance of large sections of a city for law enforcement purposes. An organization representing police chiefs from major cities around the U.S. is promoting an initiative to strengthen intelligence collection at the local level, increasing the integration of state and local law enforcement into the larger structure of the U.S. intelligence community. Harris Corporation’s standard terms and conditions for the sale of their wireless surveillance products including the AmberJack, StingRay, StingRay II, Harpoon and KingFish products. The terms and conditions document was included in a contract signed with Tempe, Arizona on October 8, 2012 for $60,321.15 worth of surveillance software, equipment and training. ‘Going Dark’ is a Law Enforcement (LE) initiative to address the gap between the legal authority and practical ability of LE to conduct lawfully-authorized electronic surveillance. 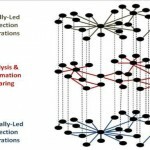 Problems highlighted by the Going Dark initiative include LE’s difficulty in receiving information from some technology companies, and criminal’s use of advanced technologies and techniques that can complicate carrying out of lawfully-authorized court orders to conduct electronic surveillance. Last month, Cryptome quietly posted a 2007 draft of the Federal Bureau of Investigation’s vision statement for the Domestic Communications Assistance Center (DCAC). The document, which has received no media attention, offers the most in depth view yet of the DCAC and its functions. In May, CNET correspondent Declan McCullagh disclosed the existence of the DCAC, which he described as having a mandate “covering everything from trying to intercept and decode Skype conversations to building custom wiretap hardware or analyzing the gigabytes of data that a wireless provider or social network might turn over in response to a court order.” The vision statement obtained by Cryptome describes the general functions and organization of the DCAC as well as the FBI’s national electronic surveillance (ELSUR) strategy. Security guards at large facilities, such as airports, monitor multiple screens that display images from individual surveillance cameras dispersed throughout the facility. If a guard zooms with a particular camera, he may lose image resolution, along with perspective on the surrounding area. Embodiments of the inventive Imaging System for Immersive Surveillance (ISIS) solve these problems by combining multiple cameras in one device. When properly mounted, example ISIS systems offer up to 360-degree, 240-megapixel views on a single screen. (Other fields of view and resolutions are also possible.) Image-stitching software merges multiple video feeds into one scene. The system also allows operators to tag and follow targets, and can monitor restricted areas and sound an alert when intruders breach them. Trap Wire dramatically increases the ability to detect pre-attack preparations and to take appropriate action to detect, deter and intercept tenorist attacks. A visual monitor of the entire system-a map with dynamic status indicators for each entity connected to the Trap Wire network- facilitates the ability of decisionmakers to absorb vast quantities of information quickly and efficiently. The dynamic status indicators show the threat level at each facility and highlight those that have moved to a higher threat level over the preceding 24 hours. Security officials can thus focus on the highest priorities first, taking a proactive and collaborative approach to defense against attacks. The information collected by Trap Wire can also be shared with law enforcement agencies to assist in their counterterrorism efforts. A 2010 price list for Harris Corporation wireless surveillance products was included in contract documentation for the purchase of multiple KingFish Dual Mode wireless measurement systems that went to Maricopa County, Arizona. Federal Reserve Bank of New York (“FRBNY”) is extending to suppliers an invitation to participate in an Sentiment Analysis And Social Media Monitoring Solution RFP bid process. The intent is to establish a fair and equitable partnership with a market leader who will who gather data from various social media outlets and news sources and provide applicable reporting to FRBNY. This Request for Proposal (“RFP”) was created in an effort to support FRBNY’s Social Media Listening Platforms initiative. Harris Corporation price list for their AmberJack, StingRay, StingRay II, KingFish wireless surveillance products from September 2008. 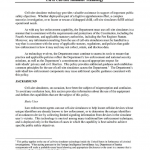 DHS Interagency Remote Sensing Coordination Cell (IRSCC) briefing from July 2011. The recent ten-year anniversary of the September 11 attacks brought a deluge of news regarding the transformation of the United States in the wake of the most devastating terrorist attacks in the country’s history. Many reports focused on debating the efficacy, or lack thereof, of policies implemented over the decade since the attacks occurred. One set of particularly revealing reports from the Center for Investigative Journalism discussed suspicious activity reporting at the Mall of America and the transformation of Homeland Security following September 11. Some publications discussed the waste inherent in the Department of Homeland Security (DHS) and its various grant programs. In addition to these critical evaluations of security policy, a number of public relations pieces from the national network of fusion centers appeared in local publications around the country. A local television station in Michigan covered the state’s local fusion center, having “unprecedented access” to walk around inside without cameras. Another piece from Tennessee discussed the Tennessee Bureau of Investigation’s fusion center, ending with appeals for viewers to report suspicious activity and “say something” if they “see something”. Articles from other states including Arkansas and Alabama, sometimes written by Homeland Security officials, emphasized the important work of their local fusion centers and the continued need for funding and support. Contact list by region including the names and phone numbers of approximately 68 Intelligence Officers and Regional Directors assigned to fusion centers around the United States. This FOUO pocket guide provides information used by battle staffs involved in planning, coordinating, synchronizing or executing actions that support the effective employment of unmanned aircraft systems (UAS) on the battlefield. Covers the MQ-1B PREDATOR, MQ-1 WARRIOR A, MQ-1C ER/MP, MQ-9 REAPER, MQ-5B HUNTER, RQ-7B SHADOW. The ICE Pattern Analysis and Information Collection (ICEPIC) system was established in 2008 to enable ICE law enforcement agents and analysts to look for non-obvious relationship patterns among individuals and organizations that are indicative of violations of the customs and immigration laws that are enforced by DHS agencies, as well as possible terrorist threats and plots. From these relationships, ICE agents develop specific leads and intelligence for active and new investigations. Identified relationships are also recorded for reuse in subsequent investigative analyses. The information processed by ICEPIC comes from existing ICE investigative and apprehension records systems, as well as immigration and alien admission records systems. ICEPIC includes capabilities that assist investigators in recording results of analyses performed in support of investigations and in capturing additional relevant information obtained from outside sources. The information collected by, on behalf of, in support of, or in cooperation with DHS and its components may contain personally identifiable information collected by other Federal, State, local, tribal, foreign government agencies, or international organizations.